With John Williams departure from the lighthouse William Flockhart found himself promoted to second keeper, but resigned shortly afterwards. Similarly to Williams, Luke Johnson – the new third keeper – found the temptation of the Devil’s Nest too much to resist. His job was lost to him for negligence in September 1832. His replacement Mathew Curwen – was reprimanded two weeks afterwards and then suspended for a week for neglect. He was suspended again in November and resigned in December. It was a troublesome time in the running of the venture. A year then passed by without anything untoward being recorded, until Lieutenant Henry Mangles Denham, the Marine Surveyor for Liverpool, visiting on a routine inspection, found that the first and second keepers had decided to discontinue their recording of the Tide Register – part of the task of maintaining their weather journal. They both received reprimands and were reminded of the rules and regulations in the strongest possible terms. In July 1834 John Christopherson and John Wallace – at that time the 2nd and 3rd keepers, were called before the Dock Committee Board following the light being found to be unlit during the night. Their lack of explanation resulted in dismissal for Wallace and a reprimand for Christopherson. Surprisingly the vacancy that then existed was filled by the return of Mathew Curwen. In June 1837 the then second keeper Hugh Williams lost his post for using “intemperate and violent language…”. In 1840 another of Lieutenant Denham’s routine visits found all the keepers absent. Curwen – by this time principal keeper – was given a warning. But Denham quickly visited again and once more found the place deserted and the light out. This time Mathew Curwen was fined £5. Then in 1841 the third keeper was dismissed for negligence, quickly followed in August by Curwen himself for his ongoing infringements and irregularities in his approach to the job over a considerable period of time. The final straw which led to Curwen’s dismissal was the discovery of him in a clearly intoxicated state whilst on duty. But to be fair, the life of a 19th Century lighthouse keeper could indeed be both boring and harsh. The upkeep of the lamps in particular was hard work, and in the cold winters it was often the case that the lamp windows had to be continually scraped free of frost inside and out. Most of the supplies that were shipped in from the Seacombe coal yards at high tide – the sperm whale oil for the lamps, the coal, food, fresh water and anything else needed day to day for the building – then had to be raised from sea level to the door above. Supplies had to be carried up the vertical ladder in back packs or hauled in on ropes and pullies – either way was exhausting. Somewhere in the region of 6000 gallons of sperm whale oil was used each year and had to be manhandled into the lighthouse. The domestic conditions were cramped and far from ideal, something which was testified to further by the fact that it was only in 1841 – eleven years after the lighthouse had been in operation that the Docks Committee purchased new bedding, blankets and bedcovers for the lighthouse keepers. By the mid 19th Century for the growing numbers who were visiting the town swings and donkey rides were available on the beach close to the lighthouse. Visitors could also enter Fort Perch Rock and the lighthouse keepers saw an opportunity in charging “a small gratuity” for visits to their own premises. In the early 1890’s a local entertainer applied to the Mersey Docks and Harbour Board (who now ran the lighthouse) for permission to dive from the doorway into the River – and it may have been this that made them realise there was already a commercial operation at the lighthouse, so a strongly worded reminder was issued that under no circumstances were visitors allowed into the lighthouse and certainly not paying customers! Throughout the 19th Century fortnightly inspections to the lighthouse were made and it was generally found that whilst the equipment was kept acceptably, the overall cleanliness of the building left much to be desired. It was consistently felt that the keepers didn’t do enough day to day maintenance and tidying. But it’s always those bad things, the problems of any situation that ring loudest and clearest… the poor housekeeping, the keepers wayward behaviour… There were positives to be found too though. In 1870 finally – an overall favourable report praised keepers John Hannah and William Jones for their clean and tidy approach and commended them for the painting of the building from top to bottom. To help them, in 1875 mains water was finally provided to the lighthouse via the fort. John Thompson Francis was another success story. He was appointed to the lighthouse in 1875 and worked there for 27 years, becoming Principal Keeper. In that time he never found himself in any trouble and he diligently performed the tasks that were required of him. He died in 1902 and at his funeral at Rake Lane Cemetery in Liscard the respect in which he was held was demonstrated by a large congregation of friends, family and local dignitaries including the then Liverpool Marine Surveyor Captain Bellam. Much drama and tragedy has been seen from the vantage point of the Lighthouse. One of the strangest scenes was on August 19th 1921, when the Isle Of Man boat The King Orry – sailing into Liverpool on a foggy summer afternoon – ran aground and just missed the Black Rock. The tide was on its way out and the ship settled. Many of the 1300 passengers marvelled at the near-miss they had just had with the Lighthouse which was only 50 feet away. The Royal Daffodil ferry and two tenders were unable to get close enough to take passengers off. Finally, at 6.00pm the Wallasey Fire Brigade arrived and watched by hundreds on the beach, with assistance from the keepers at the lighthouse they used their ladders to precariously remove 1000 passengers. The other 300 chose not to make the hazardous climb to the beach and they were still on board when the ship floated free just after 11.00pm, still watched by a now cheering huge crowd. Following ninety four years of service the Lighthouse became unmanned on 8th December 1924. Then in the early 1970’s it was decided that it was no longer needed and the last light shone on 1st October 1973. The building became Liverpool Corporation’s responsibility again and they offered it for sale. It was bought for £100 by local architect and then owner of Fort Perch Rock Norman Kingham. Mains electricity was added and some refurbishment made to the inside. There was a later plan to turn it into holiday accommodation newly weds perhaps – £50 per day with champagne and flowers part of the deal !. But despite the offer of a kitchen galley with cooker and refrigerator, first floor bathroom and shower… living room and bedroom on the next two floors.. even the temptation of a colour TV, it proved a less than popular honeymoon venue. Possibly the access which was – and is – by way of retrieving a ladder to reach the fifteen iron rungs to the door… was enough to deter most newly married couples. “The New Brighton Lighthouse is one of the most elegant and important features of the Wirral coastline. Such buildings are few and far between”. 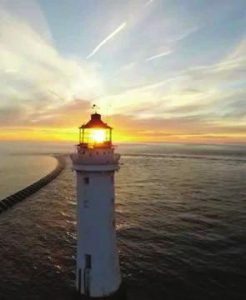 The New Brighton lighthouse is a local treasure and has a unique place in Britain’s national seafaring heritage. It was re-lit in 2016 and now has lights powered by solar panels. Perhaps there will be some move in the future to further the plans of those who think the building should be made readily accessible to the general public. In doing so it could finally be allowed to fully take its rightful place as a local historic attraction.